1. 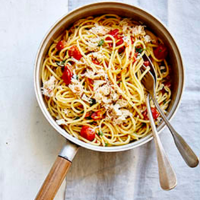 Place the spaghetti, tomatoes, chilli, garlic, shallot, wine and 400ml water in a large pan. Season and set over a high heat, then turn down and simmer, stirring occasionally, until all the liquid has just evaporated, about 10 minutes. 2. Toss with the oil and most of the zest, parsley and crab. Divide between 2 plates and top with the remaining zest, parsley and crab.